If nothing else, our leftist friends deserve credit for chutzpah. All around the world, we see concrete evidence that big government leads to stagnation and decay, yet statists repeatedly argue that further expansions in taxes and spending will be good for growth. During Obama’s recent state-of-the-union address, he pushed for class warfare policies to finance bigger government, claiming such policies would be an “investment” in the future. But it’s not just Obama. Hillary Clinton, on several occasions (see here, here, here, and here), has explicitly argued that higher tax rates and bigger government are good for growth. The statists at the Paris-based Organization for Economic Cooperation and Development (financed with our tax dollars) actually argue that higher taxes and more spending will somehow enable more prosperity, both in the developing world and in the industrialized world. And some left-wing “charities” are getting in on this scam. Oxfam, for instance, now argues that higher tax rates and bigger government are necessary for growth and development in poor nations. And Christian Aid makes the same dodgy argument. The Oxfam/Christian Aid argument is especially perverse. If they actually think that bloated public sectors are the key to faster growth in the developing world, shouldn’t they provide at least one example of a jurisdiction that has become rich following that approach? Let’s examine this issue more closely. Here are some excerpts from a column in the most recent issue of Cayman Financial Review. Written by the Cato Institute’s Marian Tupy, it looks at the challenge of boosting prosperity in sub-Saharan Africa. Marian starts with some good news. The 21st Century, at least so far, has seen genuine progress. Real gross domestic product has been ticking along at an average annual rate of 4.8 percent, while per capita income has grown by roughly 40 percent. …The benefits to ordinary people have been impressive. The share of Africans living on less than $1.25 per day fell from 56 percent in 1990 to 48 percent in 2010. …If the current trend continues, Africa’s poverty rate will fall to 24 percent by 2030. In addition, per-capita caloric intake has increased from 2,150 kcal in 1990 to 2,430 kcal in 2013. …Moreover, between 1990 and 2012, the percentage of the population with access to clean drinking water increased from 48 percent to 64 percent. Many African countries have also seen dramatic falls in infant and child mortality. Over the last decade, for example, child mortality in Senegal, Rwanda, Uganda, Ghana, and Kenya declined at a rate exceeding 6 percent per year. And foreign investment deserves some of the credit. When western multinationals enter a nation, they play a vital role in creating (relatively) high-paying and building a nation’s capital stock. Particularly since the overall economic and policy climate in many sub-Saharan nations is very dismal. 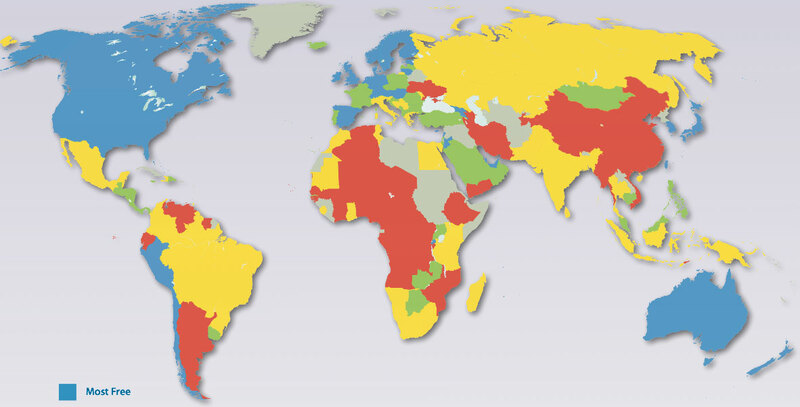 As you can see from the accompanying map, based on the Fraser Institute’s Economic Freedom of the World, most nations in the region are either in the most economically repressed category (red) or the next-t0-last category (yellow). In either case, these countries obviously have far too much taxes, spending, regulation, and intervention. Needless to say, these policies make it difficult for local businesses and entrepreneurs to succeed, which means the jobs and prosperity made possible by foreign investment are absolutely vital. But Marian warns that this progress could come to a halt if African nations fall victim to class-warfare proposals that seek to demonize multinational firms as part of a push to expand tax collections. The problem with this ideology, as Marian explains, is that foreign companies won’t have nearly as much incentive to create jobs and growth in Africa if tax policy becomes more onerous. Africa has one of the world’s riskiest business environments. Government accountability and transparency are low. The rule of law and protection of property rights are weak. Corruption is high. In a sense, low taxes compensate domestic and foreign investors for shortcomings of the business environment that are more difficult to address: a low tax rate can be legislated overnight, but corruption-free bureaucracy takes generations to accomplish. What’s true for corporations is also true for individuals. Many wealthy Africans continue to work and create wealth in the difficult African business environment in part because they know that at least a portion of their wealth is safe from inflation and predation. But the most important part of Marian’s article is the section where he debunks the notion that bigger government somehow leads to more prosperity. …the argument in favor of higher tax revenues assumes that government spending is an efficient driver of economic growth. This is a common misperception in the West, which is now being applied, with potentially disastrous consequences, to the developing world. In America, for example, Hillary Clinton has argued that more revenue improves economic development and the “rich people … [who] do not contribute [jeopardize]… the growth of their own countries.” She has urged “the wealthy across the Americas to pay their ‘fair share’ of taxes in order to eliminate poverty and promote economic opportunity for all.” Is the former Secretary of State correct? Are developing nations suffering from inadequate levels of public spending? Is there a need for more revenue to finance bigger government so that national economies can grow faster? Marian looks at the actual data. And he makes the absolutely essential point that western nations became rich when government was very small and there was virtually no redistribution. According to the International Monetary Fund, government outlays consume, on average, about 27 percent of economic output in sub-Saharan nations….the burden of government spending averaged only about 10 percent of economic output in North America and Western Europe through the late 1800s and early 1900s – the period when the nations in these regions enjoyed huge increases in living standards and evolved from agricultural poverty to middle-class prosperity. If the goal is to have African nations copy the successful growth spurts of western nations (keeping in mind that per-capita economic output today in sub-Saharan Africa is roughly equal to per-capita GDP levels in Western nations in the late 1800s), then the latter’s experience implies that high levels of government spending are not necessary. Indeed, too much spending presumably hinders growth by leading to the misallocation of labor and capital. Moreover, it should be pointed out that the United States and other currently rich countries also had no income taxes when they made their big improvements in economic status. In other words, the best recipe for African prosperity is the one that worked for the western world. Sub-Saharan Africa needs small government and free markets. And, yes, there is a role for government in providing the rule of law and other core public goods, but African nations already collect more than enough revenue to finance these legitimate roles. Of course, not all government spending is bad for growth. Upholding the rule of law and protecting property rights costs money, but helps growth. Historically, African governments have been at their weakest when providing for these “night watchman” functions of the state. And their economies suffered as a result. Were African governments to focus on a set of narrow, clearly defined goals, they would find plenty of revenue to finance their accomplishment – without having to resort to punitive tax policies that are likely to undermine Africa’s long term economic prospects. P.S. Since today’s topic dealt with tax havens, that’s my excuse to share this interview with the folks at the Mises Institute. I wax poetic about why tax havens are a liberalizing force in the global economy, while also touching on issues such as double taxation, corporate inversions, financial privacy, and FATCA. For more information, here’s my video series on tax competition and tax havens. P.P.S. On a completely separate topic, I’ve often made the point that the “Obama recovery” is very anemic. Well, here’s some new evidence from the Wall Street Journal. Wow, less than half the growth we got under Reaganomics. Seems like a good opportunity for me to reissue my two-part challenge to the left. To date, not a single statist has successfully responded. @Rev D.E. : The taxers in Washington D.C. are not required to follow the same laws as you and me. Insider trading, foreign accounts, ponzy schemes… no problem, if you are an elected representative. That progressive Maoist Democrats want to further divide between the rich, their royalty status and rest of the proletariat is no surprise. Every oppressive government and the politicians within steal (tax) all the wealth from outsiders (non-rich, non-political royalty). That Democrats are no different than any other Communists or Socialists is no surprise–at least it shouldn’t be if you can think. The GOP is different in name only (and not a pair between all of them). res ipsa loquitor. Used to be we hung or shot communists; good republican (small “r”) values are all but lost. Soon we will be a third world country. PS. The only good politician is cold and six feet under. Elect only neighbors you know to public office; let the others rot in hell. But we all knew who ultimately benefits from growing government, right? Pretty sad that those who advocate for higher taxes on everybody else, are those making the most use of these “tax-havens”. Gee. I smell hypocrisy all over the world here! I believe in smaller governments and more free markets. That is my solution to increasing prosperity. Some thoughts on development and the role of #Taxation and #Tax policy on the potential outcomes for growth in Developing Countries. But for the fact that it would probably “provoke” a military attack (see NATO attack on Libya) various African nations might want to consider introducing hard money directly via gold coins (as well as silver & copper & Bitcoin, as wanted/needed). The key is for one of them to deliberately NOT have a central bank. If Africans *want* to use constantly-inflating USD or hard to mine gold or even-harder-to-mine and constantly-deflating Bitcoin, let them choose in an actually-free market, for once. Seems like the charities mentioned are pro-competition. Don’t they realize that higher taxes means lower charitable giving? When big government takes over the role of “charitable giver” it is unlikely it will do so in an altruistic manner. More likely, charitable giving will go to groups that benefit directly or indirectly the individuals doling out the money. In two three decades, many Americans will rather be in “on your own” selfish countries like Hong Kong and Singapore, rather than Hillary Clinton’s “American village of compassion”. These economically freer countries are already surpassing American prosperity levels. By contrast American psyche is predictably and fatally attracted to the “don’t worry we (ie. others) will take care of you” European model. Partial implementation of this model is already bringing America closer to Europe, now on display as a structurally and systemic lower growth trendline – not at European levels yet but way below world average – i.e. decline. The worst part: Predictably, as historical evidence suggests, the American middle class will attempt to claw back its privileged status on top of world prosperity with … more redistribution. The death spiral to decline has closed.